The “Featured Products” area of our storefront showcases those products that we feel are exceptional because of their value, design, or quality. We recently added a product which we feel meets all three of those criteria. We are pleased to offer a line of specially priced “Cast Aluminum Exit Signs” which include self-testing diagnostic capabilities and an additional brushed aluminum faceplate at a fantastic price. National safety regulations require that all exit signs be tested for functionality once every twenty-eight days for five minutes and ninety minutes every six months. This testing is time-consuming and labor intensive, especially in facilities/locations with a large number of installed signs. A self testing exit sign will perform routine self-diagnostics and warn you when there is a problem. This functionality can provide a significant cost savings over the lifetime of the product. The aluminum faceplates have “knock-out” left and/or right chevrons which can be removed to indicate direction of emergency egress. The second faceplate allows for double-sided installations. The “knock-out” chevrons and double faceplates allow these signs to be fully configurable for every conceivable installation type. These are exceptional values and will not last for long. 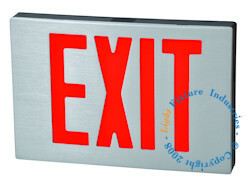 What’s keeping you from enjoying the architectural beauty of cast aluminum exit signs today?